The story is that terrorists have seized the underground control complex of a nuclear missile site, and it is up to the player to infiltrate the base and kill the enemy leader. 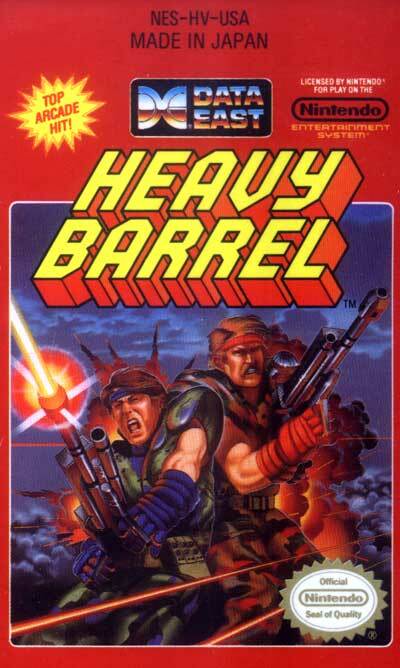 The name "Heavy Barrel" comes from a powerful weapon within the game that the player collects pieces of throughout the game. If all of the pieces are collected, the player can wield it for about 30 seconds. The players started out with some sort of laser gun that had unlimited ammunition (which occasionally proved necessary) and a limited supply of grenades. Players might find better weapons, grenade powerups, or keys to unlock boxes which themselves might have better weapons, grenade powerups, orbs (if you had 2 players), or one of the 6 pieces of the Heavy Barrel superweapon.